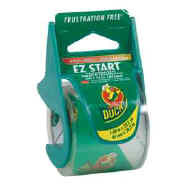 Duck® Brand EZ START® Packaging Tape never loses its end. It also doesn't split or tear and always unrolls "Smooth and Easy"™. Clear tape resists yellowing and is 2.6 mil thick. It even comes in its own dispenser. EZ START® Frustration Free® Packaging Tape never loses its end - even when you don't fold the edge over!